Handcrafted elevator boots with upper in white suede leather and tone-on-tone rubber sole that ensures maximum comfort and durability over time. 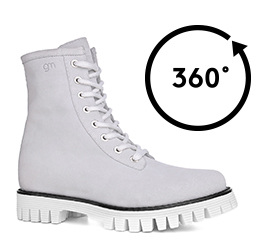 A "total white" boot ideal for the spring season to match perfectly with different styles. The internal elevator system is able to increase the total height up to 4 inches (10 cm) in total secrecy. Made in Italy.